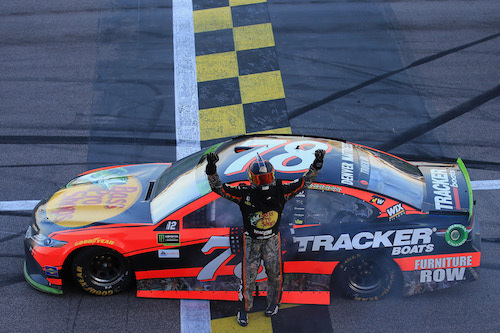 Martin Truex Jr. celebrates his win of the Hollywood Casino 400 at Kansas Speedway on Oct. 22, 2017 (photo courtesy of Getty Images for NASCAR). The No. 78 Furniture Row Racing team of Martin Truex Jr. raced with heavy hearts at Kansas Speedway near Kansas City on Sunday, as they lost road-crew fabricator James “Jim Watson” to a heart attack the previous night. But that didn’t keep Truex and company out of victory lane, as they won the Hollywood Casino 400, their seventh win of the season and third of the 2017 Monster Energy NASCAR Cup Series playoffs. It also completed a 2017 Kansas sweep, adding to their win there from earlier this season. Ryan Blaney was third after starting the race in the back as a result of his car failing post-qualifying inspection Friday. Chase Elliott and Denny Hamlin rounded out the top-five. Sunday’s race at Kansas was the elimination race of the second round of the playoffs. Drivers seeing their 2017 championship hopes come to and end included Ricky Stenhouse Jr., Jamie McMurray, Matt Kenseth and Kyle Larson. Kenseth and McMurray were among the 14 drivers involved in a crash on lap 197 that started with a spin by Erik Jones. Jones also hit the wall head-on and his car got airborne before the crash was over. The race was red-flagged for track clean-up, and Kenseth was parked for the remainder of the race, because his team had one too many crew members working on the car while it was on the five-minute crash-repair clock. Larson retired from the race with the first blown engine of his Cup Series career on lap 77. Stenhouse, meanwhile, struggled throughout the race before finally hitting the wall with just under 100 laps to go. Some of the drivers who advanced also had their problems. Even eventual race winner Truex wound up in the back twice — first for a restart penalty during the first caution of the race on lap 35 when he went below the white line, and again, when he made an unscheduled pit stop for a loose wheel on lap 91. Jimmie Johnson spun twice around lap 200 of the 267-lap race and recovered to finish 11th. Brad Keselowski wound up 13th after two pit-road speeding penalties, including one during the 10th and final caution of the race on lap 235. Kyle Busch led a race-high 112 laps, with those laps coming between Truex stints up front to start and finish the race. Truex led the first 35 laps before his restart penalty and returned to the lead with a pass on Busch with just over 50 laps remaining. Busch won the first 80-lap stage, but Hamlin won the second with a pit strategy of staying out when the yellow waved with four laps remaining in the stage. After running up front throughout the middle portion of the race, Busch and Harvick fell victim to the final ill-timed caution that came after both had made green-flag pit stops and, as a result, had gone a lap down. They took the wave-around during the caution and were in the top-10 at the end of the race, with Harvick finishing eighth and Busch 10th. Other top-10 finishers included Chris Buescher in sixth, Dale Earnhardt Jr. in seventh, and Aric Almirola in ninth.